Four McMullens real ales were on offer, and both the ales I tried were in good condition. Nice seating areas to both front and rear, and I'm advised by a local resident that the Sunday Roasts are excellent. Nice barmaid with a sense of humour. Definitely worth a visit. This is a nice and cosy little pub that has a conservatory built on the back which was accommodating some diners during my visit. There were three ale offerings from McMullens along with some standard draught, but my Guinness wasn�t the best. There is a large plasma screen which was off, but some background music was playing at an unobtrusive volume. The staff and locals seemed nice enough and I would visit this pub again if in the area - hopefully the below par pint was a one off. Visited with two friends at the end of a great crawl in Hertford. The pub was quite unchanged since my last time here three years ago, and McMullen's AK was well kept. Cosy interior remains, divided up into three main drinking areas. Visitors to the Millstream are advised that closing time routine is fairly strict. 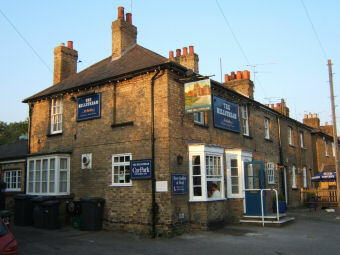 The pub is best enjoyed early on in the evening when you can relax in the beer garden which is spacious and accommodating. Laura and her locals are among the most friendly folk you would ever want to meet in a pub. The draught beer is very well kept. Great place! Comfortable friendly and well appointed end of terrace local in a quiet gentrified part of town. Almost a rural feel to the locality. McMullens Cask, AK and seasonal Harvest Moon. Pleasant looking rear garden and a restaurant area to the back of the pub. Decent looking menu included half a lobster for 11.95.Largish plasma showing football scores, decently turned off when the prog finished and the Saturday dross commenced.